These handmade porcupine quill boxes are one-of-a-kind. 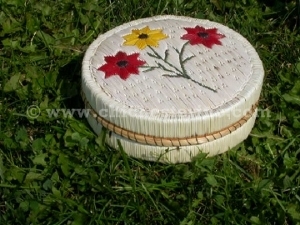 They are made by Ojibwa artisans from Manitoulin Island in Ontario, Canada. Native Americans use these to store jewelry and small household items. Beautiful and unique, they are made from birch bark bases covered with designs made of natural and dyed porcupine quills. Most have natural-colored backgrounds and are trimmed with sweet grass. Sizes will vary from about 1" in diameter to boxes that are 12" or wider. For each porcupine quill box we select, we reject 10 to 20 because of warped birch bark, poor designs, broken quills, and improperly fitting lids. We offer only the best of the best.